Don’t look now, but Arctic Cat and Polaris enter 2012 with two very sophisticated, very smooth running two-up touring sleds that provide more power from their turbocharged engines than some popular modern automobiles. For example, the Polaris 750cc four-stroke turbo motor generates 140-ish horses, which is on par with the latest 1.4 liter Chevrolet Cruze turbocharged four. And, then, there’s the Arctic Cat turbo motor that pumps out 177 horses, more than Toyota’s popular four-cylinder Camry. Keep in mind that these decked out sleds weigh substantially less than their automotive counterparts. 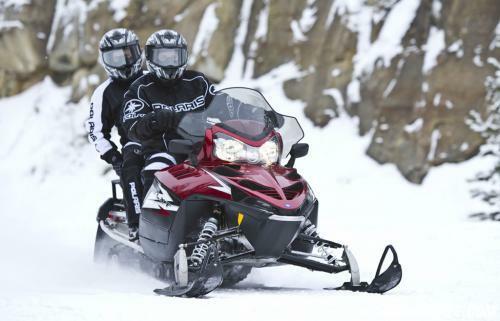 When most snowmobilers think in terms of high-performance sleds, they rarely figure touring sleds into their conversation. Well, maybe they should. Maybe we should. 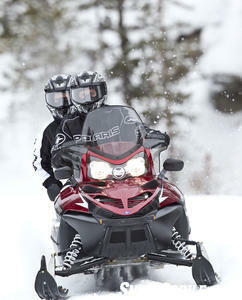 Serious touring sleds like the Polaris IQ LXT offer smooth drive-offs as well as on-trail speeds. The top of the line two-up turbocharged touring models offer surprising performance. Surprising only because no one looks at performance first. Polaris’ power tourer relies on a proven 750cc four-stroke twin. Consider for a moment that this engine is about half of the latest high-tech Chevy Cruze powerplant, but generates similar overall power. Both the sled and the car utilize turbocharging to get the power numbers. In addition Polaris has created a very reliable drive system that will provide an over boost situation for up to four seconds for quick acceleration. Then the engine reverts to normal boost to work with the proven Polaris P85 driver and P2 driven clutch system for smooth power in and out of corners. We admit to frequently being surprised at how quick and how strong this sled can be at top end. It just doesn’t “look” like a performance sled. But it will get you some serious speeding fines in every snow state if you aren’t careful. That’s not just because it’s deceptively quick, but also because it is incredibly smooth on the trail. 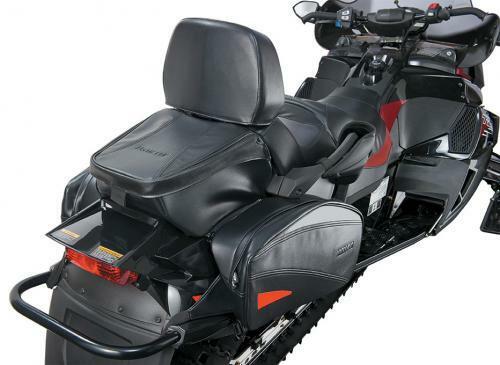 The top of the line Touring Cat comes loaded with a heated seat, bags, adjustable handlebars and 177 horsepower. The Arctic Cat TZ1 Turbo LXR comes with an even bigger displacement motor at 1056cc and nearly 40 more horses. This is a serious touring sled that can more than pull its own weight on any trail system. It, too, is very smooth for easy take offs and it will also gather speeding tickets if you don’t pay attention. The liquid-cooled Suzuki-built twin offers outstanding torque to lets its 144-inch track grip and rip snow in the faces of sport riders. If you want it too! The LXT’s IQ front end uses RydeFX shocks to control its 10-inches of travel. Generally, folks that buy these “turbo chargers” look more at how the sleds are equipped than how fast or quick they are. Let’s just say that they both can handle any groomed trail and some marginally cared for ones as well. The Polaris relies on its 136-inch length track spinning around an updated 2012 Polaris IQ 136 Comfort suspension. You’ll find top grade RydeFX and RydeFX MPV shocks handling the bumps underneath you. The double A-arm IQ front end uses RydeFX MPV shocks to tame 10-inches of trail travel. Compare this smooth set up with Arctic Cat’s use of its stretched out FasTrack Slide-Action rear suspension that comes equipped with adjustable torsion springs, fiberglass overload springs and a torque-sensing rear linkage for smooth transitions under acceleration and deceleration. The front suspension works off the seventh generation of the trend-setting Arctic Wishbone Suspension. 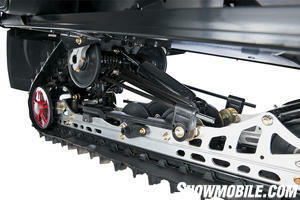 Arctic Cat engineers came up with the design way back when other sled makers were holding on to trailing arm designs. Cat has this AWS thing down pretty well heading into 2012. Of course, when it comes to serious touring, high mile riders not only want the latest in power and handling, but they also demand the goods, like exceptional ergonomics and lots of bells and whistles. Both sleds offer plenty, but the Arctic Cat adds a few more. Of course, you pay a premium for these. Cat’s cruiser suspension offers fiberglass overload springs to make two-up riding smoother. Both sleds feature pillowy comfort seating, complete with adjustable backrests, a rear rack area and storage bags. Arctic Cat goes one better by adding in a heated seat, which may seem a bit excessive until you find yourself riding in some truly cold or damp conditions. Then this feature takes out the chill. When you want to get underway, you can use the Cat’s remote start feature to get the sled warmed up and ready to go. The Arctic Cat TZ1 Turbo LXR is built around the ride forward chassis that is just now being replaced by the latest ProCross chassis designed for the sport set. The Twin Spar chassis design offers plentiful leg room, an adjustable seating position and nearly infinite handlebar settings to let you fine-tune this sled for your touring style. Based on the IQ platform, the Polaris Turbo IQ LXT gives you rider forward seating that combines with Rider Select steering. There are five settings that let you sit back for effortless cruising or advance the handlebar set for a more upright riding style, useful in handling uneven or mogul-pocked terrain. The stretch-tracked two-up turbo cruiser comes complete with backrest, cruiser windshield and rear storage bag. You’ll find that both turbo touring sleds can handle groomed and ungroomed trails quite well as the extra track length — 136-inches with the Polaris and 144-inches on the Arctic Cat — lets the sled bridge bumps and even out the trail. The extra long tracks grip snow with authority, keeping a secure hold in the corners. When it comes to on-trail manners, both sleds prove adept as the front ends grip well and are pretty neutral when cornering at trail speeds. 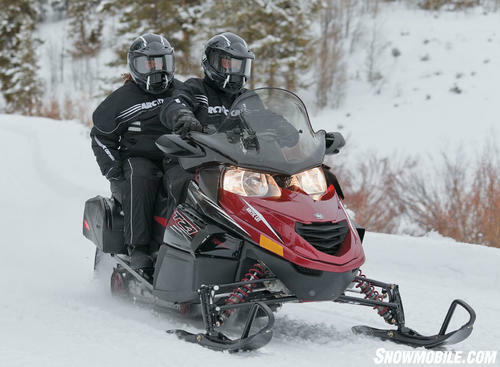 The ride on both proved smooth and with the Arctic Cat’s added fiberglass overload spring feature, the sled can be further tuned to accommodate a passenger and luggage — a benefit for saddlebag touring, where you carry all your gear onboard the sled. You can carry all your gear for a weekend’s “destination” tour with the Cat’s stowage bags and rear rack. What we find surprising in sleds like these is just how well they suit serious riders. And we don’t mean simply touring riders. The Polaris Turbo IQ LXT and the Arctic Cat TZ1 Turbo LXR can smoke a smug sport rider in a straight-line acceleration run. And they can readily pack a weekend’s worth of snowmobiler’s “getaway” gear for a serious weekend of destination-to-destination riding. In the final analysis, we look at the 2012 Arctic Cat turbo cruiser as having an edge on overall horsepower and “goodies,” but are those extras worth the few thousand dollars more in retail pricing over the Polaris? Only the buyer can answer that. We don’t think you’ll get gypped with either sled. They are seriously performance oriented for the high mileage rider. And they come with more performance than some much-ballyhooed new cars!